Essential plot rundown: Adam struggles with cancer with the help of his best friend. I really liked this film. There is good drama with some funny moments sprinkled throughout. One thing I liked about 50/50 is the roundness of the characters. Now, I'm not saying that these are super developed, fleshed-out characters. But, they could have easily been one sided but were not. I liked seeing how the different characters dealt with the situation in their own ways. They are all frustrated and make mistakes. I thought all of the actors did a good job. Unlike another recent movie that I saw, but didn't want to blog about, where I never believed the actors were their characters (here's looking at you, Season of the Witch) I found Joseph Gordon-Levitt and co. all believable. I could feel what they were going through. I have never had to deal with a situation like this, but I could related with all of the characters. 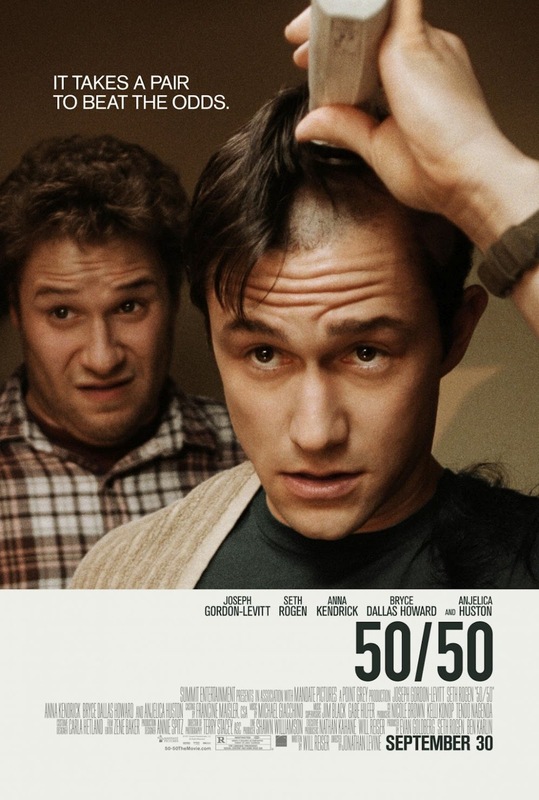 50/50 is rated R "for language throughout, sexual content and some drug use". And afterwards, I got thinking about the language. I was curious as to how the film would turn out if the swearing was written out. The constant use of the f-word isn't essential to the story, but it does add a sense of realism and frustration to the film. I'm just curious if the film would have been the same, better or worse if it had been re-wrote to get a PG-13 rating. But that is neither here nor there. Overall, it's a really good film. It wasn't as emotionally engaging as I was anticipating. (I didn't cry as much as I expected). But I could feel JGL's pain as he struggled with his disease. I would recommend it.